While Jan Ziska was campaigning against Ulrich of Rozemberk, the armed forces at Prague were commanded by Hynek Krusina, former military commander of the Orebite faction of the Hussites. He besieged the Vysehrad castle at Prague from September 14290 on, his roughly 12.00 men being camped Southeast of the castle, cutting of its communications and food supply. W hen an attempt to resupply the castle by river was thwarted by the Hussites, Sigismund felt compelled to act. He brought a force of some 16,00 men and attempted to draw off the besieging Hussites by raids and attacks on smaller outlying towns, but was unsuccessful. The garrison had become desperate by the end of October, and negotiated an agreement whereby they would surrender if no relief appeared by November 1st. Sigismund, who was awaiting some 2,000 additional troops from Moravia,dithered and the appointed day arrived, and the commander of the castle kept his word, and the garrison surrendered the castle to the Hussites. They were allowed to keep their hand weapons but no heavy armaments. Upon learning of the surrender, Sigismund, who by his inaction was in fact responsible for the fall of the castle, became enraged. He was convinced there was a conspiracy against him by his Czech and Moravian nobles, which was aggravated by the fact that the garrison commander was also Moravian. When the Moravians arrive following the fall of the castle. their leader, Henry, advised Sigismund that an assault on the cast;e would be bloody and doomed to failure. In response, the Holy Roman Emperor ordered a frontal attack on the castle,and specifically assigned his Moravian and Bohemian (Czech) soldiers to charge directly at the Hussite guns, while giving his German and Hungarian soldiers much less hazardous positions. The assault was, predictably, a bloody failure, and Henry himself and over 500 of his men were killed, and many more captured. As a result of this spiteful conduct, most of the remaining Moravian Royalist soldiers defected to the Hussite cause, and the Praguers began dismantling the great Vysehrad castle. Characteristically, Sigismund singled out his Bohemian nobles and their retainers for the blame which belonged properly to himself. Their standard bears the White Lion of the Kingdom of Bohemia. On November 5, 1420, the Hussite leadership sent out a message to all of Bohemia, accusing Sigismund of shaming the Czech nation with undeserved charges of Heresy, and attempting to replace native Czechs with Germans and Hungarians, and instigating a civil war between the Bohemian Hussites and Catholics for the express purpose of weakening the Czech nation., and hastening its extermination. A remark attributed to Sigismund, to the effect that he would happily give away Hungary if he could only kill every Czech was particularly convincing, and stirred nationalist sentiment even among the conservative Catholic nobles. Many new nobles joined the Hussite cause as a result, and those that remained wavered even more in their support of Sigismund. Among these later was none other than our old "friend", Ulrich of Rozmberk, one of the most two faced men who ever lived! Being a Hussite banner, though, this one incorporates both the Chalice and the Host as well! In November 1420, Jan Ziska and his men moved against yet another of Ulrich's towns, that of Prachatice. Ziska had conquered this town twice already, and each time the town agreed to accept allegiance to Tabor and the Four Articles of Prague. Each time they had reneged on their promises when the danger was past, expelling most Hussites and burning a few at the stake for good measure. Despite the town's repeated bad faith, Ziska again promised to spare the lives and possessions of all in the town if they would allow hist Taborite forces to enter, the townsmen already being deployed defensively along its walls. They replied with a sarcastic and offensive rejoinder. Understandably Ziska's patience was at an end, and he ordered an attack, stating that none of the inhabitants would be spared afterwards. The town fell after a brief fight, with 135 defenders being killed in the attack. After freeing a handful of Hussites, in keeping with the savagery of this conflict, the remaining 92 townsmen were burned to death. The women and children were spared but told to leave immediately, and the town was resettled by Hussite peasants. The detail on these Kingmaker figures is superb! Following further reverses, Ulrich sought an armistice with the Hussites. By its terms, which would expire in February 1421, the Hussites were granted free [passage through Ulric's domains, and Ulric agreed to accept the Four Articles of Prague, thus granting freedom of Hussite worship much of the rest of Bohemia. Thus by the end of 1420, the Hussite cause had achieved great success in both securing Prague against further attack, and expanding their religious influence. Unfortunately, as the year drew to a close, infighting between the Hussite factions once again intensified. Some basic shading followed by an application of my darkest version of the Magic Wash" really brought out the detail in these sculpts. Hussites armed with Polearms, by Kingmaker. Women were definitely known to have fought alongside their men in support of the Hussite cause. Thus some Kingnaker women are included on these bases! The figures come with an assortment of different polearms. Still, the war Flail is the most characteristically Hussite polearm. The elongated "tails" of the hoods remind me somewhat of the lekku or "brain tails" of the Twi'leks of the Star Wars universe (see this article in Wookiepedia). The name is based on the practise of taking communion “under both kinds”, or “sub utraque specie.” This was the moderate element of the Hussites, comprised mostly of the merchant class and minor nobility in the urban areas, especially Prague. They benefited greatly from the confiscation of property from the Catholic churches. This faction attempted to negotiate with Emperor Sigismund in 1419-1420 with no success. Hussite Crossbowmen by 1st Corps. The Taborites represented the most radical sect in Hussitism, believing in equality under the law for noble and commoner, the equal distribution of wealth, communal ownership of property and decision making by elected council rather than noble fiat. To the Taborites, clergy were unnecessary, biblical interpretation was an individual matter, their communion services were held on hilltops and their children were baptized in rivers and ponds. They established themselves in the fortress town of Tabor. Once again, great detail on these figures. I do have to say, though, that these Crossbows were a real pain to attach. The nature of the join was such that all attempts with super glue failed, as did going to just epoxy. I finally had to use the fast drying Duco cement to hold them in place and then slather on epoxy later for a more lasting bond. Quit annoying, actually! "Veritas Vincit", or "The Truth will Prevail", is accompanied by the Chalice emblem of the Hussite cause on this banner. Well, no one would accuse these fellows of exposing much flesh, would they? All three of these groupings now form part of my "Brown" Hussite contingent. Back a few months ago, I ordered a variety of inexpensive plastic palm trees from China through Ali Babba. I now understand the process a bit better - Ali Baba basically acts as a middle man for many Chinese manufacturers. This makes it somewhat hard to estimate shipping charges at times. For my palms, I wanted a variety of heights and styles, and I didn't need hundreds of trees. Thus it took quite a bit of shopping around on the Ali Baba site to find exactly the items and quantities that looked like they would work best. Ultimately, one of the items was cancelled when the supplier was unable to ship them within Ali Babba's fairly tight time frame, and each item wound up arriving in a separate mall parcel over the course of a bout a month. Fortunately, unlike the rest of the world, shipping charges from China seem to be incredibly low! Here's an example - 20 x 4" tall palm trees. Here they are unpacked. All of these trees have the plastic "pegs" on the bottom for model railroad layouts and the like. A close up shot with an Eureka 28mm Assyrian figure for scale. While I was in the Turks and Caicos Islands last month, I did some filed research on Palm trees, assisted by Rum Punch and other potent potables. This style of Palm, such as coconut Palms,, seemed to have most trunks more grey than brown, and the frond-like leaves were often a dusty light green. The Short Palms like those at the top usually seemed to have a red-brown trunk and medium to dark green leaves. Interestingly, Palms are not native to the Caribbean or the Bahamas, even though we routinely associate both with them. This top down view illustrates the point that their are two different major styles of leaves found on Palms. Elongated, frond like leaves , such as those on the left, and wide, "palmate" leaves like those on the right. The Date palms that I saw in the Islands all seemed to have Palmate leaves... some very, very large! This is the final style of Palms that I got - short with large, palmate leaves. All of these will probably get some dry brushing of the trunks and leaves before use. All told, I got about 52 palms for about $25. Not bad at all! There should be quite a few of these appearing in my Egypt vs Assyria game at Historicon in July. After the withdrawal of the Catholic Crusaders from Prague on July 30, 1420, Sigismund and his remaining Bohemian and Moravian supporters established themselves at the Royalist/Catholic stronghold of Kutna Hora. Following his coronation as King f Bohemia outside Prague, these same followers had promised Sigismund that they could deliver Prague to him by negotiation if he would dismiss his foreign troops. When this proved to be impossible, Sigismund was furious and began to suspect the Czech nobles of being secretly in collusion with the Hussites. The Holy Roman Emperor had a decidedly paranoid streak to his personality which, if perhaps not entirely unjustified, certainly made him difficult to deal with! Meanwhile, there was no chance that the citizens of Prague or the Hussites as a whole were ever going to accept Sigismund as ruler,. and they started their own diplomatic efforts with an emissary to the Serene Republic of Venice, which had its own reasons to distrust the Emperor. They also set about looking for a man to crown as their own KIng of Bohemia, a move which Jan Ziska supported,. as he felt that only a King could unify the various factions of the country. Their first choice was King Wladyslaw of Poland, who had been tentatively approached before. A letter and ambassador (whom Sigismund tried to capture, but failed) were sent to him in August, familiarizing him with their grievances against Sigismund and the Four Articles of Prague. This mission ultimately failed to obtain any firm commitment from the Polish King. My entire Old Glory Hussite collection, deployed in a Wagenburg. Meanwhile, with the immediate threat to Praque removed, the Hussite factions fell to squabbling once again. The Taborites once again complained that the more moderate Hussites were too far from their own Puritanical beliefs, and once again issued demands fro controlling the teachings at the university, forbidding the wearing of luxurious clothes, and calling for the destructions of "unnecessary" churches and all monasteries. These buildings were the pride of Prague, and the source of her reputation as one of the most beautiful cities in Europe, and the more moderate Hussites were aghast at these patently ubnplataltable edicts. On August 10, 1420, a Taborite mob broke into the monastery that held the tombs of the Kings of Bohemia. Finding no monks to slaughter but abundant wine in the cellars, they became drunk, disinterred the body of the late Wenceslaus, and set the buildings on fire. Not content with this, on their return they made an intoxicated assault upon the Vysehrad castle. This was easily repulsed by the Royalist garrison, with the attackers suffering heavy casualties. Further Taborite demonstrations followed, whilst the city Counselors tried to delay a decision in the hopes that the Taborites would soften their hardline stance. Finally, on August 22nd, 1420, the entire Taborite contingent marched out of Praguie without giving any explanation. Likely their motivations were several, including the political gridlock, the fact that they were no longer needed to defend the city, and especially that the men, women, animals, and wagons were needed to bring in the harvest. Somewhat oddly, the Old Glory Hussite range doesn't include ANY command figures, foot or mounted! Therefore, I used these two spare Hussite cavalrymen to provide some leaders for my Hussite army. A rather clumsy application of green stuff on wire was used to fashion large maces, of the kind that Jan Ziska is often depicted bearing. After telling off men needed to harvest the grain in the surrounding countryside, \Ziska and his forces promptly moved to Pisek, where they recruited fresh troops and began a campaign against Sigismund's strongest supporter in the area, Ulrich of Rozmberk. 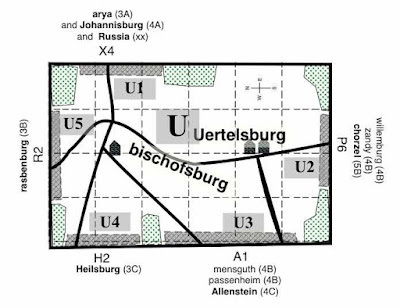 Ziska's men captured a number of Ulruich's towns and castles, and burned his fields and drove of his cattle. Ulrich, however, scored a success of his own when he captured Korabnda, the spiritual leader of the Taborite faction, who had been a moderating influence on some of the members of the increasingly radical community. This lead to the Taborites electing their own Bishop, and declaring their complete independence from the Pope and the Church of Rome, a move the more moderate Praguer Hussites were by no means ready for. Ziska supported the new Bishop, Nicholas, and together they atempted to reign in some of the more extreme and mystical sub sects arising in Tabor. In early October of 1420, Ziska attacked and captured the strategically important town and castle of Bor Pansky. The townspeople and Ulrich both called for assistance, which arrived in the form of three Royalist forces, including one lead by Bohuslav, who had fought Ziska previously. They arrived too late to prevent the loss of the city and castle, but outnumbered Ziska's mean heavily. 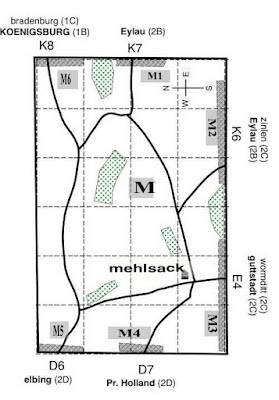 They attacked, and Ziska established a wagenburg on top of a hill. The Royalist attacks were repulsed with heavy losses, while the Huskies suffered significant casualties as well. Frontal view of the Wagon Fortress. In action,. the horse teams would be unharnessed, and the gaps filled with pavises and defenders. The limited Hussite cavalry generally sheltered within the Fortress until the enemy had exhausted themselves with unsuccessful assaults. In many ways, the Wagon Fortress defensive tactics of the Hussites resembled the later entrenched positions taken up by the Spanish during the Great Italian Wars, such as those of Gonsalvo de Cordoba at Cerignola or the Marchese di Pescara at La Bicocca. This post has been in the works for a long time. My motivation for finishing it is both the Hussite game that I am running at Historicon with "To the Strongest", and the resultant additional Hussite figures I am painting using the fine Kingmaker models. The first of those posts should be forthcoming soon as well! The "big game" that I am running at Historicon this July is "The Great Cavalry Action of Liebertwolkwitz". While the existence of this action, fought on October 14, 1813, just before the the Battle of Leipzig, and said to be the largest cavalry engagement of the Napoleonic Wars, is fairly well known to wargamers, it turned out to be relatively difficult to find good sources on it. I have listed my on line references at the end of this post. The Orders of Battle that I have developed below are for use with Field of Battle, 2nd edition, by Brent Oman. For the purposes of this scenario, I have used 1 Infantry unit = about 900 men, one Cavalry Unit = about 600 men, and 1 Artillery unit = about 12 guns. I have done some minor fudging as needed to accommodate my collection and for play balancing. 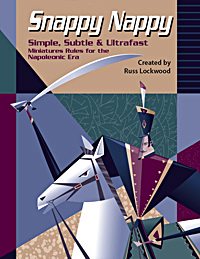 Winter 1807 Snappy Nappy Campaign: The GM speaks! Overall, I was quite pleased (if I do say so myself) with the way the game and the day turned out. It would appear to me that the GM only really (unintentionally) screwed up one player - Napoleon, perhaps making the French Victory Conditions more than just a trifle unachievable. Oh, well, cannot win them all (sorry Seth!). 1) Players should all have a good time, all have authentic reasonably historical military challenges, and that operations should reach some reasonable conclusion by the end of the day. Ideally, both sides would have an authentic (but not necessarily equal) chance for victory. 2) I wanted to try out several game mechanics such as the Deployment Zone concept with players self-navigating among tables without GM assistance, the use of 15mm troops on The Portal's small tables, tracking casualties via the casualty rings rather than the paper-and-pencil OB rosters, and self-regulated play with players largely able to conduct battle without a GM constantly present. 3) Allow each side to organize itself, develop plans, and consider contingencies the week before the game with a view to expanding the player experience to beyond just the one day. You all can judge for yourselves how well this all worked. Major organizational elements of the campaign required that (as far as I am concerned) I read at least two campaign histories in depth (Petre, 1906; Arnold, 2007), get and then develop a good map, develop historical OBs, obtain and organize the figures (I only own Prussians), develop table maps and recruit guys to dress tables, and lord knows what other myriad details were required. I undertook this all both because every now and then (say every two years or so) I really enjoy a massive project like this, and as I indicated above, there were some things I wanted to try. 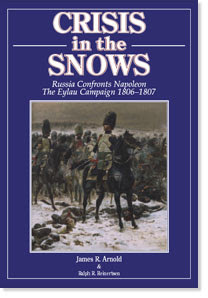 Crisis in the Snows, by James Arnold (himself a wargamer). This, like his earlier Crisis on the Danube, is a great book. It is pricey but well worth it.! I still need to but the sequel on the Spring 1807 campaign, and for that matter, the second half of the 1809 campaign. I lent my copy to James as a source for background material for the campaign - I agree with him as far as reading at least 2 in depth sources as part of the planning process for this kind of event. 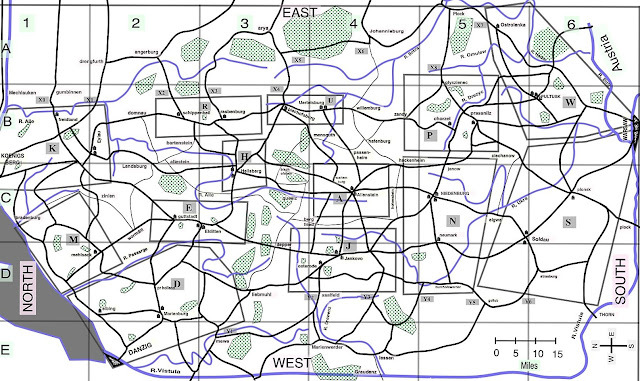 I needed a map which did several things: Showed an authentic road and maneuver network, showed where table boundaries, showed table inter-connections within the area of operations, and showed the terrain for each table. I located a game called the The Eagles Turn East, which covered exactly the campaigns in eastern Poland, scanning its game board and adapting it to an electronic form. For what it is worth, the campaign operations area was almost exactly the same size and shape of Connecticut (allowing you must rotate Connecticut by 90-degrees). This is roughly an area 175 miles north/south by 90 miles east/west, remembering this is all in the bitter cold and deep snow of eastern Poland in February 1807. I actually used probably a third of the roads and towns from the game board (that board being a 5' x 3' hex grid - massive detail !!). This map gives you an idea how crafty James was in both using natural barriers as "off table" barriers, as well as the spaces in the map between tables. This definitely threw most of us off, as in the past there have been distortions, but major towns on the player map always appeared on the table - not so here! For criteria as to how I wanted my final operations map to look, I had decided to shoot for a dozen table tops (that's what we had for the Waterloo game last year), and I wanted enough roads to create a maneuver network allowing at least two or three ways to reach any given destination. 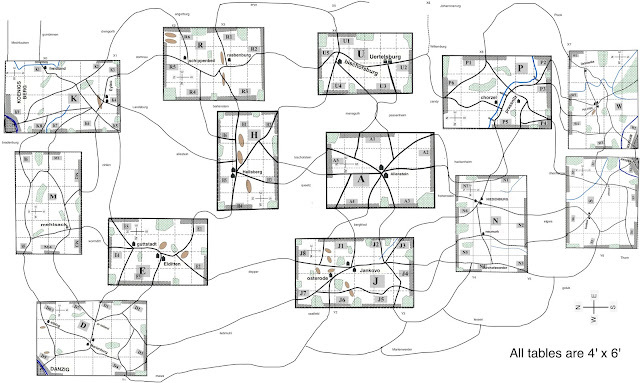 In addition, since the entire operations area could not be modeled on just a dozen tables, I decided the tables themselves would represent (as Russ intuited) "interesting" areas where battles might occur. Rivers would lie along and just off table edges, justifying why battles were fought at the given locale - you fight adjacent to, not in the middle of rivers. I deliberately located table boundaries around significant road junctures and then I artificially shmushed rivers around a bit to bound where I figured I wanted tables to appear on the Op map. That left some towns unreachable by players as they maneuvered across tables. To deal with this, I marked roads leading off tables as going to these "unreachable towns" with the net effect that it was possible to "walk through" any location on the road map, but you could not necessarily stop there. For example, a road leaving Table A might say that you were heading onto Table B, along the way getting to say the town of Depper. 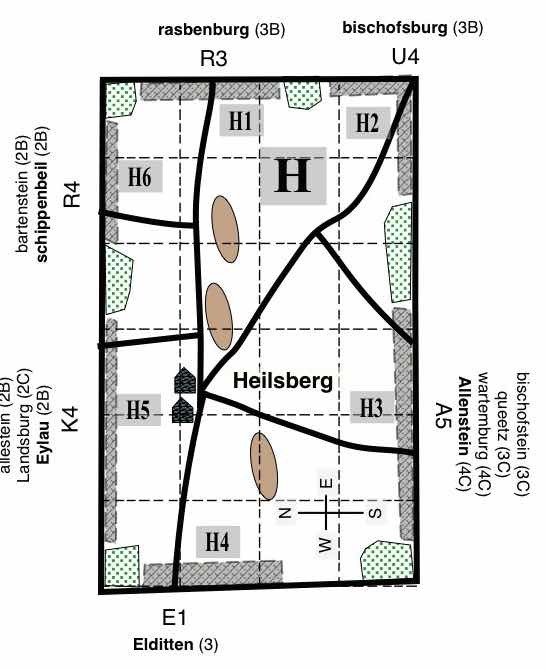 However, when you got to Table B, the Table B map would tell you Depper was exactly back the way you had just come. Probably a bit of cruel GM joke this, but I figured it a level playing field (both sides equally affected), and frankly, I did not want the player's maneuver map to show only the table top towns - such would make map reading less authentic. Side commanders had to assign routes of march and destinations based on their maps and players then had to figure out how to navigate the actual territory (a la the principle that the map is not the territory). The net result was that few tables had rivers, a good thing because they were frozen anyway and tabletop rivers steal precious table space. 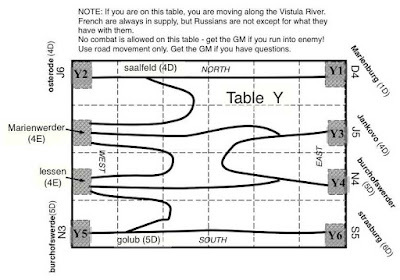 Most significantly, if a GM runs a river through a table, guaranteed one side or the other on that table will rest a flank on the river with the table space on the far river side typically unused and wasted. Therefore, my logic that rivers were "just off board". To allow that rivers (and unplayable forest areas) create defiles leading to bottlenecks, I tried to make Deployment Zones proportional in size to the connected off-table terrain features. 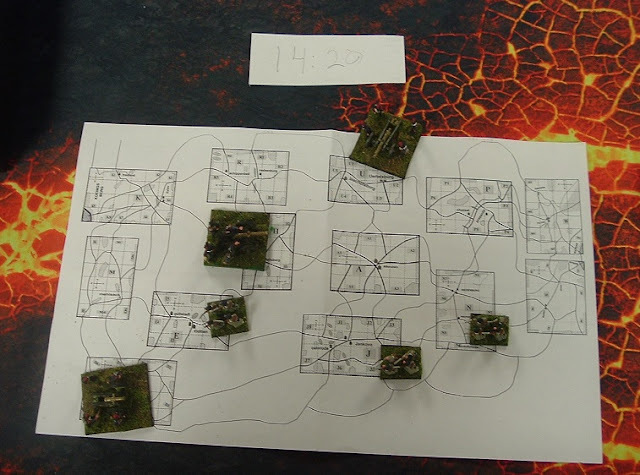 A small DZ connected to an off-table river crossing constrained the number of troops that could enter a table from the given direction just as debouching from a bridge or forest road defile would so constrain deployment into battle. As a player, THIS is the map I would love to have had - all thirteen tables with their road connections! Actually, there were even 2 MORE tables, "X" representing the Easternmost road network, and "Y", representing the Westernmost road net. 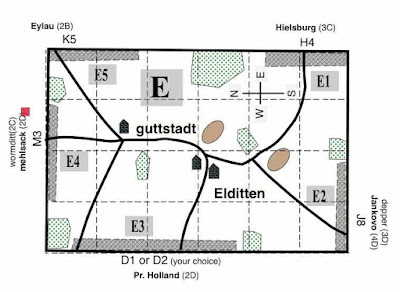 I should note that there are two "holes" on the campaign map (large areas without a corresponding table top presence) - one being the area surrounded by Tables R, H, E, and K, and the other area being smaller, covering the map area between Tables E, J and D. These gaps existed because I wanted to foreshorten the Heilsburg table to better represent this actual historical battlefield, and there simply was otherwise too large a map area to cover without using another table or two. 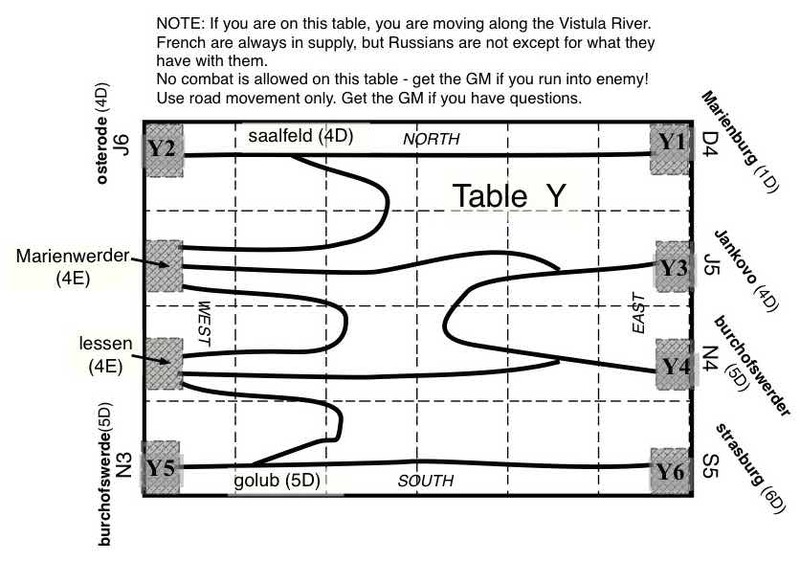 Note also that the ground scale on the N and S tables (French setup tables) covers about twice as much real world space as do the other tables, again, because it was the easiest way to address the needed table / map coverage and this area was unlikely to see combat. 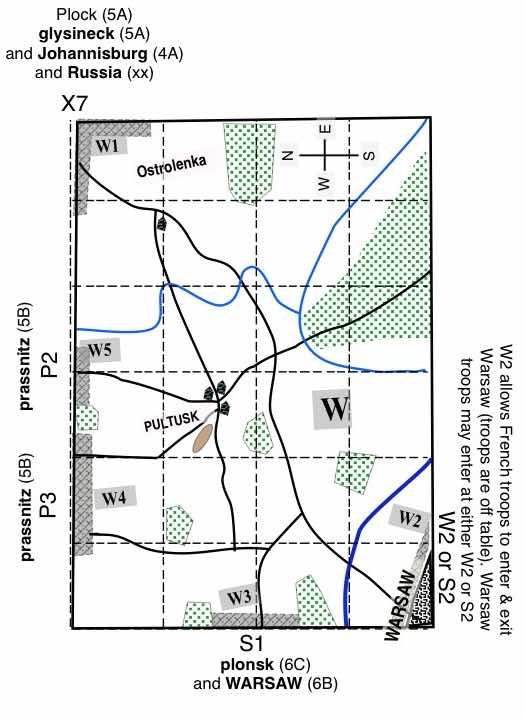 The net effect of these various distortions was that the French probably had a good 30 miles less to travel (relative to the historical French) when marching from Warsaw to Danzig or Koenigsburg. DZs are “ transfer sites” between tables. 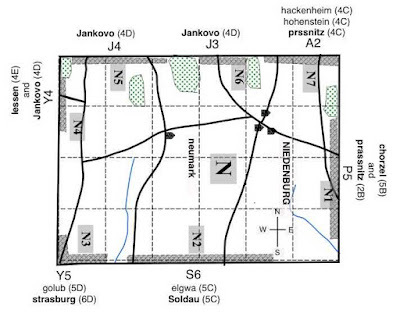 - Tables have printed maps showing DZs & table interconnections (see diagram). 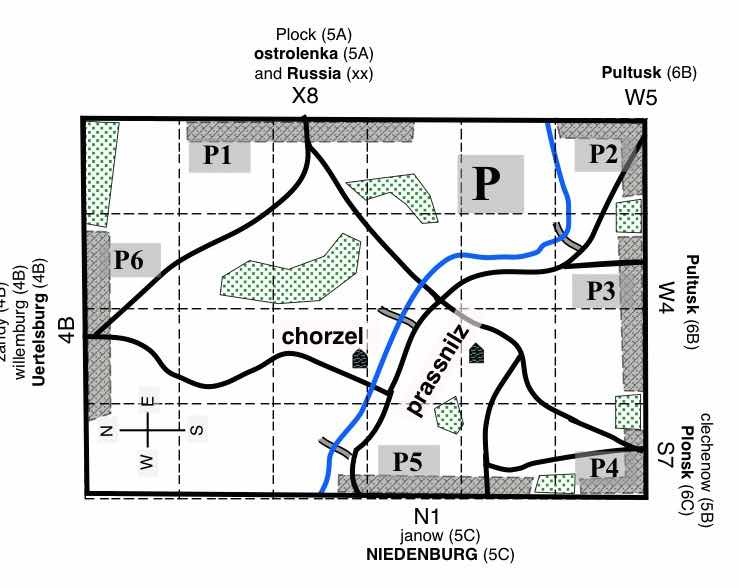 - Example: On Table W, zone W4 connects to the town of Prassnitz via the P3 zone on Table P, zone W3 connects to zone S1 and the town of Plonsk on Table S, etc. 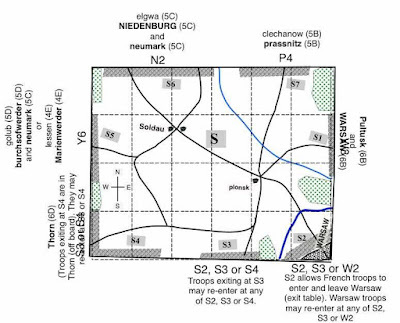 - Another way to put it is that troops moving into the W4 DZ would transfer to Table P, entering at its P3 zone, thereby getting to Prassnitz. 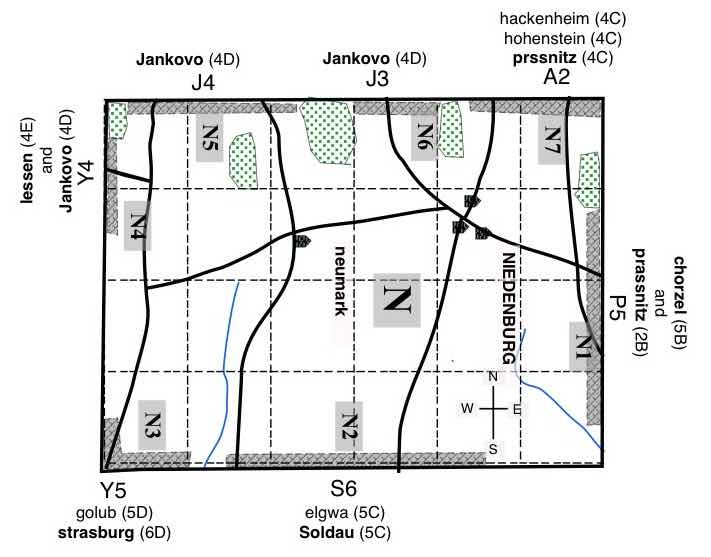 Units coming from the city of Plonsk via the S1 zone on Table S would enter Table W at the W3 zone, etc. 1) WHEN UNITS WALK INTO A DZ: On next turn, they must transfer to other table OR reenter current table. Players get a free set up of the transferred units in other table’s DZ. A) TURN SEQUENCE: Units join table’s current turn sequence, BUT only after opponent has had a full normal move phase. B) EXIT! A Unit must exit a DZ as soon as it may move. It could transfer back to its original table. NO ping ponging between tables! C) SAFETY: Units may not be attacked in nor attack from within a DZ. 3) SPECIAL SITUATIONS: Get the GM if you have questions. I opted to make all command radii 18" for simplicity and because 18" was a major leash in the supply rules (it being the max distance a supply wagon could feed a unit). I know the 18" Russian command radius tremendously favored the Russians (versus had they been saddled with the game's 9" Russian command radius). 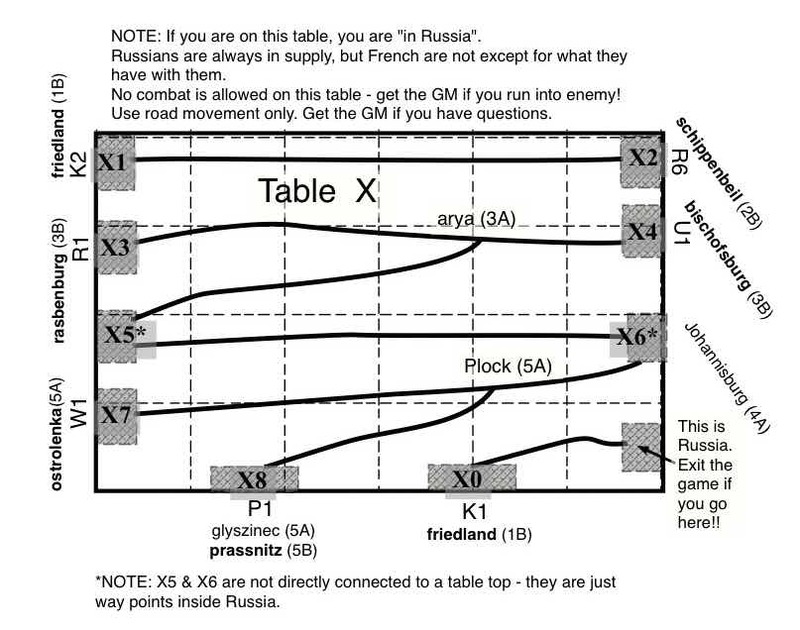 However, quite simply, as a GM, if I made the Russians use their 9-inch "historical" radius (Russ - do note the scare quotes :), how do I compensate them for game balance? Is their coordinated starting position compensation (see below)? Do I give them easier VP (victory points)? Do I give them more troops and if so, how many points more? Since I had no idea how to balance this out, I chose to make it a non-factor. 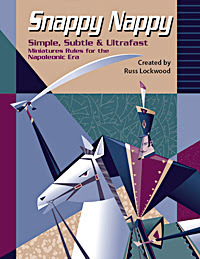 Snappy Nappy, by Russ Lockwood. There is a lot more information on Snappy Nappy here, along with purchase information. By the same token, for simplicity and frankly as a bit of GM personal preference, I allowed units out of command radius to roll their morale to get a normal move and get a formation and/or facing change with no move if they failed (the Rules as Written say 1/2 move on success, no move whatsoever on failure). As far as I know, this never entered play, but I suspect both sides left several cavalry units screening their rear areas to act as a slightly mobile "trip wire" should enemy make an appearance. I suspect the respective side commanders were more comfortable leaving these penny packet forces behind because of the easier out-of-command rule (and as a GM I like seeing attention to such rear-area security). Both sides had pretty close to the same number of troop quality bases (same number of Veteran, Elite, and Guards), excepting the 350-odd points of Russian Seasoned guns was balanced against 350-odd points of French Veteran stands (a net plus of maybe 150 points to the French in my estimation). I chose to play without Snappy Nappy's formation orders system (p. 16 - Attack / Probe / Screen / Maneuver / Defend / WIthdraw / Rally). Quite simply, across a dozen tables and upwards of 20 guys, as a GM I find it virtually impossible to consistently and fairly enforce the orders on players. I did allow players to Rally to recover morale loss. All roads were primary roads for simplicity. In addition, players could converse if on the same table and otherwise had to use written messages. My readings of the campaign histories (Arnold & Petre) indicated how uniquely severe was the issue of exposure and supply in this campaign, short as the campaign was. As such, I spent an undue effort trying to develop and boil down reasonable supply rules, bouncing ideas off Peter, Russ, Phil, and Mark H., all of whom I can absolutely credit with helping me get down to something that in fact might have been reasonable. Oh - I should also mention that Peter took it upon himself to create some FORTY-TWO supply wagons and some dozen depot markers in anticipation of my needs. Turned out all was for nought, as, come the day, I chickened out in order to get the game moving in a timely way. In retrospect, it probably would have been easy enough to play with the supply rules, but as I think Peter has said somewhere, it is not clear the supply rules really would have made much difference. Then again...., maybe we will get to see and try them out some other time. I should note that supply and the risk to LOCs was one of the factors I' had hoped would influence overall strategy and maneuver between each side. Dropping the supply rules meant Napoleon did not quite have that arrow in his quiver with which to threaten a deep Russian advance (but then neither did Benningsen have such against Napoleon). C'est la vie! 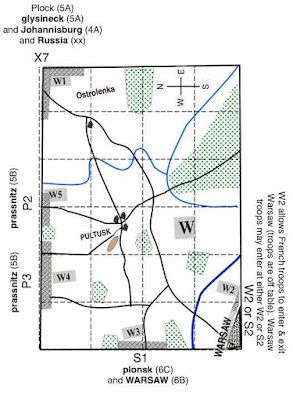 The historical campaign situation demanded the French start "wrong footed" (this expression being Peter's) with two French corps out on a limb to the north, and the rest of the French army being far to the south in and around Warsaw and Thorn. 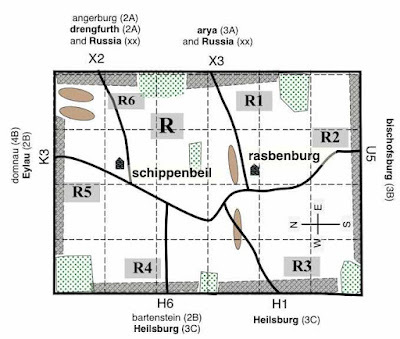 Historically, Bernadotte (French I Corps) was covering the isolation of Danzig, while the historical Ney (French VI Corps) had chosen to advance his forces halfway across the map to as far as Schippenbeil (grid cell 2B on the road map). I knew these historical French assignments were going to be horribly challenging to the assigned French players, so I arranged for two very experienced players (Mark M. as Ney and Robert - last year's Napoleon - as Bernadotte). I also had standby players planned in case one of these two could not make it. Unfortunately, Rob and the French standby both had last minute issues keeping them away, which left Mike getting slotted into the meat grinder that Bernadotte's command suffered through. If truth be known, I had originally planned (heh, heh) for Russ and Dan to be Ney and Bernadotte. However, when player requests came back, pretty much a full slate of pre-registered players wanted to be French, which bumped Russ and Dan to the Russians (they willing to play either side). Since the historical Ney was actually rather out of touch with Imperial HQ regarding his whereabouts and his plans, I had decided that initial communications between between Ney and Napoleon would incur a 30-minute communication delay. This was just my best guess as to what was fair, what would allow the situation to appropriately develop, and whatnot. Bernadotte's messages would have the 15-to-20 minute delay I used for most of the day with all messages. The historical Benningsen wanted to perform some sort of aggressive move against Napoleon, but in fact knew little if anything of Ney's advanced position and little of Bernadotte's (Bernadotte was just arriving into position when the Russian onslaught hit him). 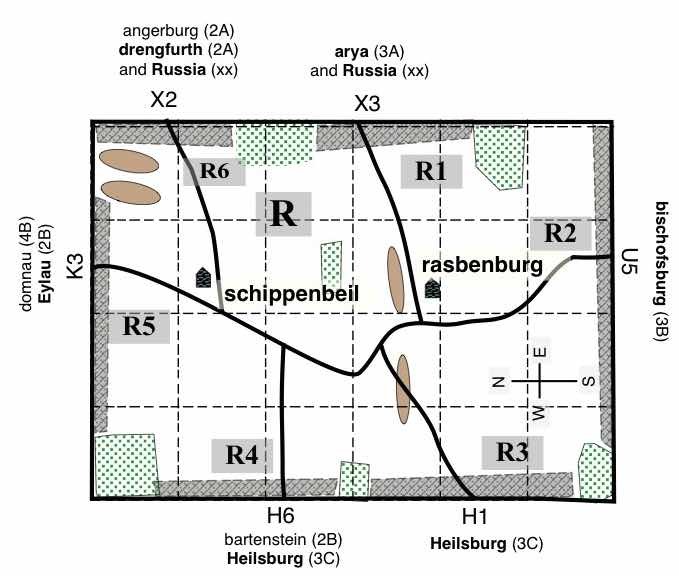 As such, the historical Benningsen marched rather far afield across what is the top of the Operations map, striking westward (down on the map) into Ney's position around Heilsburg and then into Bernadotte, hitting both more by luck than design. I had no way to completely keep Benningsen (the player) in the dark (I had borrowed the Arnold book from him after all), but I of course told Peter little of the French deployments, and he was a gentleman in not informing his players what to possibly expect. Because I did not want to artificially constrain the Russians (I did not know how to reasonably do so), I allowed them to enter however they wanted from the top of the map (excepting the Johannisburg - Williamburg road which they knew was out). [GM note: bit of a map screw-up on may part - I failed to early catch that this road connected three DZs - a distinct no-no, which I patched by shutting the road down.] Because of the Russian flexibility in entering the playing area in a highly coordinated way across a wide area of the map, I did try to compensate the French. I made the Russian victory conditions require they fight far to the west to obtain their most lucrative victory points, thereby exposing the Russian LOC to potential thrusts by Napoleon. Of course, dropping supply rules meant lessening the seriousness of this threat. Literally knowing absolutely nothing of the either the Russian or French pre-game plans, I still knew opening moves would almost certainly follow a particular pattern, with Ney and Bernadotte being badly surprised. As GM, I made every effort to insure this. The way these two players reacted would largely determine the early part of the game. As it happens, both chose to stand and fight, having no idea if, when, or if ever succor might arrive or what affect their stand might have on the game. In 20/20 hindsight, I do wish I had not emphasized so strongly to all French that they were not allowed to move off their starting table without Napoleon's explicit orders, as players have a tendency to believe the GM in these things (to be fair, I also qualified the restriction by saying, "No moving..unless facing overwhelming odds", where to my mind, 2:1 is starting to get pretty overwhelming). 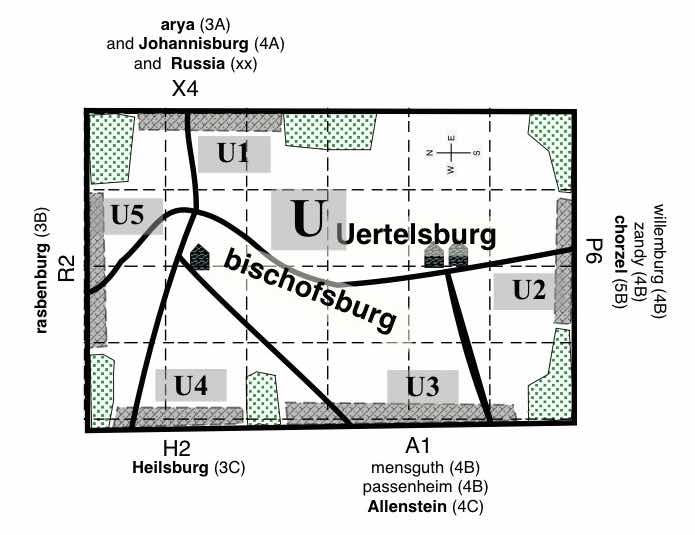 In the game, Ney (Mark M.) started at Heilsburg (Table H, map grid 3C) rather than Neidenburg (Table N) as Napoleon expected, and Ney was the only French player allowed to move on the first turn (this being essentially what happened with the Historical Ney). Quite the surprise that in the first minutes of moving, French cavalry spotted masses of Russians coming from the extreme east and Russians so immediately spotted French! The one communication that went awry the whole game was from the French cavalry spotting these Russians (sorry Mark - but I'd predetermined it - that cavalry's warning was for YOU to prepare, and we're only talking 10 minutes here), so Ney's first report received by the Emperor came from when Russians started to enter Ney's Table H at Heilsberg. 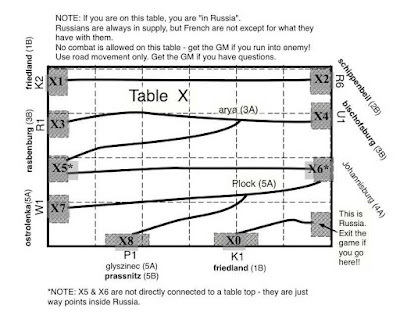 Shortly afterwards, Russians maneuvering north of Ney (this would be Russ as Osten-Sacken with the Russian 3rd Division) and Dan (as Golitsyn with the 2nd Russian Division) debouched almost simultaneously in front of Bernadotte on Table D (the Danzig table - are you getting the theme how tables got their letter IDs?). Bernadotte, so it seemed to the GM anyway, seemed not well apprised of the overall strategic situation, he was set up mid-table and not covering his LOC or possible retreat path. Again, to be fair, because the LOC was made a non-issue, We are responsible (note due use of the "royal We" here). Excepting for a message Bernadotte sent to Napoleon literally just minutes before the arrival of the Russians (something about the wonderful brothels his men were finding in the Danzig area), near as I know, there were no further communications from Bernadotte to Napoleon informing Nappy about Bernadotte's predicament. However, I may have this wrong, as Napoleon (Seth) once he heard of the Russian movements from Ney certainly started to move heaven, earth, and all the French to Danzig (including trying to order Ney there!). Ney of course was messaging madly away, but, dang, he was far from where the established Imperial Courier service routes. The net result was that, unlike their historical counterparts who turned and bolted for their lives, our Ney and Bernadotte dug in and refused to budge, becoming anvils that the on-coming Russian masses pounded against. The opening moves started I believe a tad bit before 11am, with the first two GM-controlled moves completed I believe around 11:15am. Ney's scouting cavalry spotted the Russians at about 11:20am, with the Russians seriously entering Ney's table shortly after 11:30. I would guess this was about the arrival time of the Russians on Bernadotte's table also. Napoleon received Ney's first missive at 11:55am, with French orders going out shortly thereafter. In the time lapse video, I notice all French disappearing from their starting table around 12:15 - 12:20 and quite literally everybody is off-camera by 12:30pm, indicating they are at least to the Allenstein or Jankovo tables (Tables A & J), and approaching the Danzig table. Truth to tell, French movements got really hazy for me as the GM at this point until so many of them had arrived at the Danzig table, starting to do so a tad before 13:00 and continuing into Danzig until around 14:00 (there's a 13:00 message from Soult saying he is deploying for entry to the Danzig table). 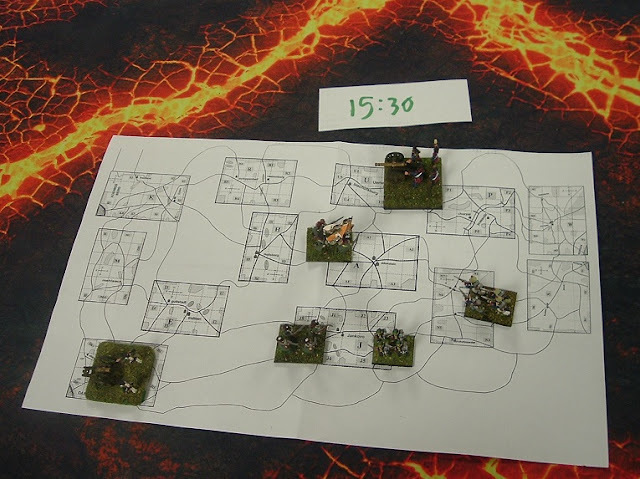 Anyway, I make out that the fight on the Danzig table had been going for a good 90 minutes by the time serious French reinforcements were arriving, and it was to continue for over a further three hours before I called the action. 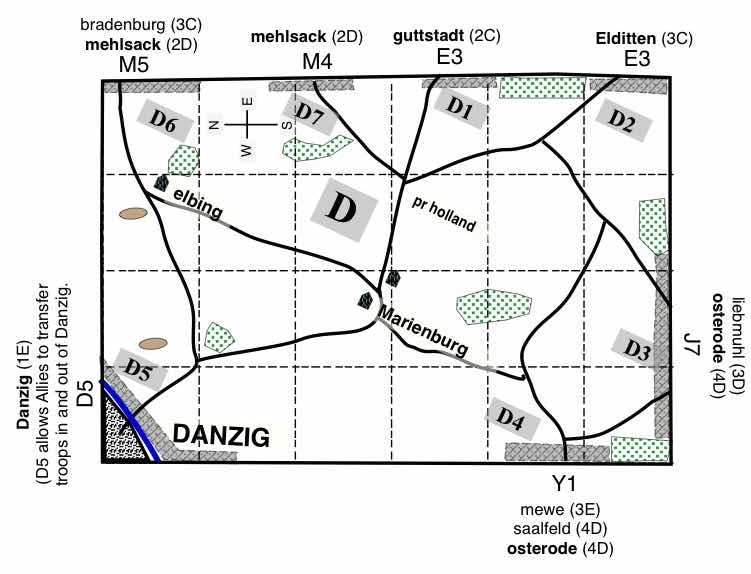 It seemed to me, both from AARs and from my sense that the French were rather bottlenecked on the routes and DZs they used to get into Danzig. I certainly might have this wrong. 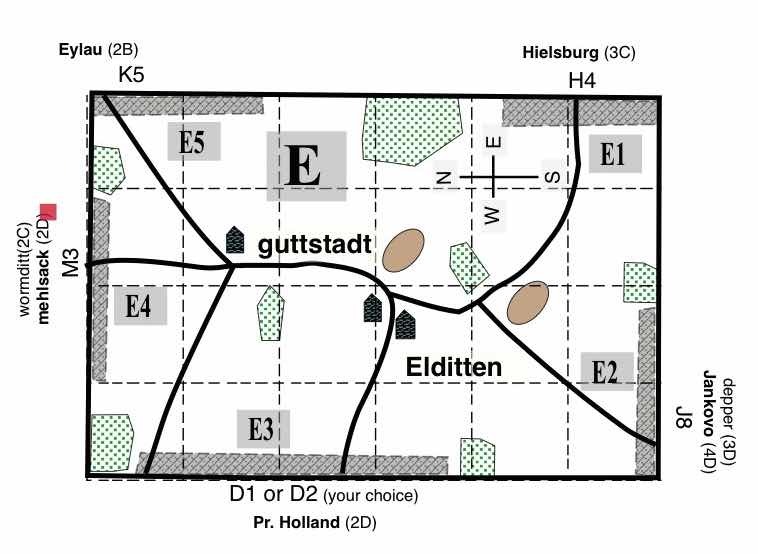 From messages, there seemed to have been some peeking back and forth of Allies and French from the Elditten (Table E) and Mehlsack (Table M) tables, but no serious thrusts. 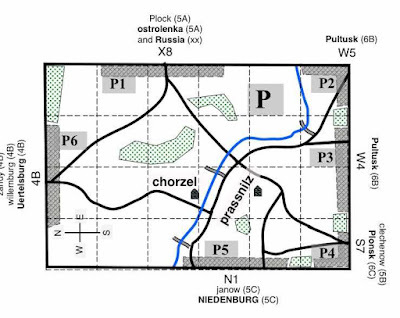 L'Estocq (Mark T.) covered the Russian rear at Mehlsack and Danzig, but seemed to have largely kept himself in reserve, until around 15:00 when he left half his forces covering the Russian LOC at Mehlsack (I believe), using the other half of his force to make a half-hearted move for Jankovo (Table J, a vital victory point for the Allies). 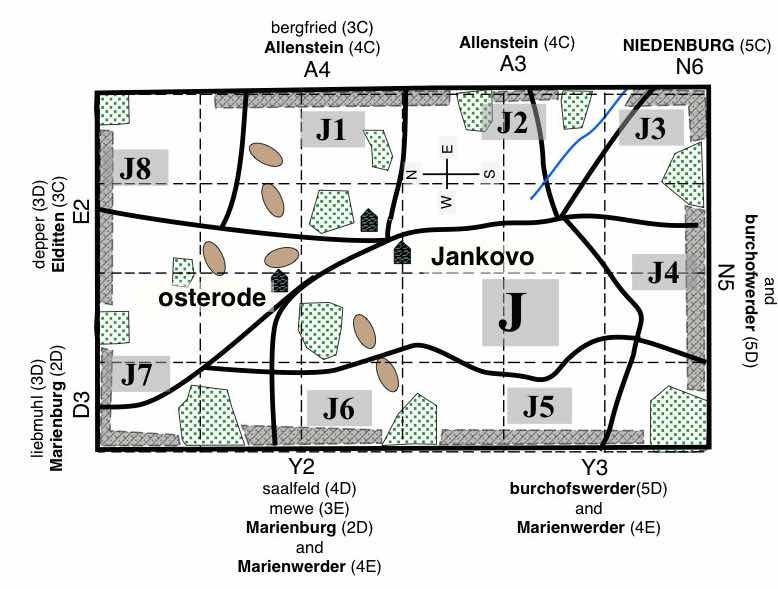 Finding the route unguarded, he slipped into Jankovo thereby "relieving the isolation of Graudenz" (a 1 VP credit). 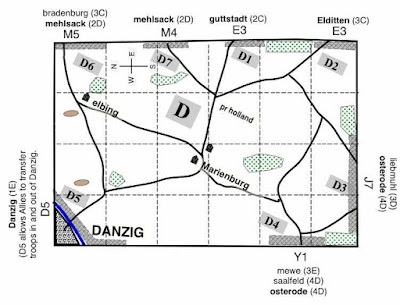 Meantime, Ney's remnants had escaped Heilsburg, heading west (downwards on the Op map) to try to link up with Napoleon at Marienburg (on the Danzig table). 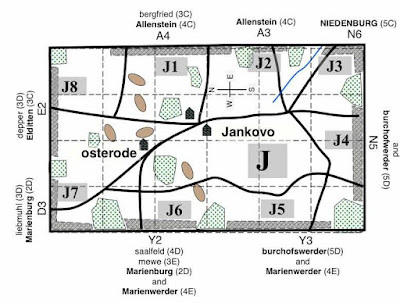 Instead, Ney encountered the Prussians at Jankovo just in time to prevent the Prussians from moving freely on towards and threatening Thorn, Warsaw, and the main French depots. However, Ney's presence recaptured the Glory by blocking the Prussian threat to the French depots behind him at Neidenburg and further south at Warsaw and Thorn. Had we played say another two hours, who knows what would have happened here, but at some point, all good things come to an end, and night falls. C'est le guerre. Whilst all the sturm und drang around Danzig occurred, up at Bishofsburg on Table U, Max (Davout, French III Corps) and Jim (Sedmoratzky, Russian 6th Division) were having a hammer-and-tongs knockdown, drag-out fight-to-the-death of their own. I witnessed most of this directly, helping GM much of it. I make out that about 12:30pm on Table U at Bischofsburg, Davout encountered Sedmoratzky. Sedmoratzky's mission was to be the easternmost blocking force protecting the main Russian army LOC back into Russia. For almost four hours the two of them went at each other, with Davout finally out of cavalry and his infantry in defensive squares. (Davout only had one unit, but Sedmoratzky had two cavalry units). Sedmoratzky ultimately got the better of the French, in no small part thanks to the 18" Russian command radius allowing him to swing his cav wide around and into Davout's. As for Ney, Bravest of the Brave, Zaniest of the Crazies, truly a magnificent fight. I make out he single-handedly held open the French army's main route into Danzig (as far as I understand the matter at the moment). 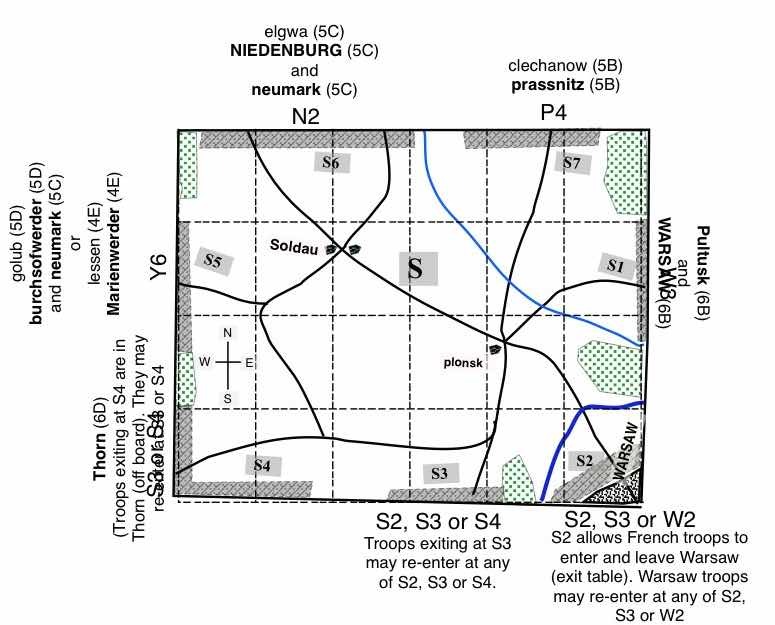 Had Ney withdrawn early, the Russians would likely have advanced to Table A at Allenstein, making a French advance through Table A or through Jankovo to Danzig highly unlikely. 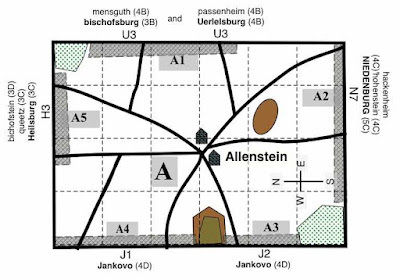 The big fight then likely occurring around Allenstein [a GM original expectation, if truth be known]. So, kudos to Ney for holding open the door for the French move on Danzig. On the other hand, whilst Bernadotte would surely have been sacrificed had Ney fallen back, Ney would have met up with the main French army, then turning to take on the forces chasing him. I expect the French would have enjoyed a decided superiority in force on Table A (or possibly Table N), at least until Osten and Golitsyn could finish munching Bernadotte and arrive to help. A big fight on Table A might also have allowed forces to be sent to Davout's aid to turn the Russian eastern flank (or vice versa - Russian forces to aid Sedmoratzky to drive Davout back and then perhaps slipping into Neidenburg (Table N) behind the French fighting on Table A. Ah, so many possibilities. Then there is Ney's retreat at the end, fortuitously blocking Allied easy movement against the French depots. Without Ney retreating when he did, the door to the French larder would have been all but open to the Prussians. T'is better to be lucky than good, so I've heard it said. As for other might-have-beens, there are some interesting ones. The above configuration in fact precluded either side trivially walking across the other side's LOC without detection. However, any player's force could easily have brushed aside the above screening forces, allowing a direct threat to the enemy rear. This is strictly my general perception and without any detailed knowledge of the specific tactical or operational considerations. 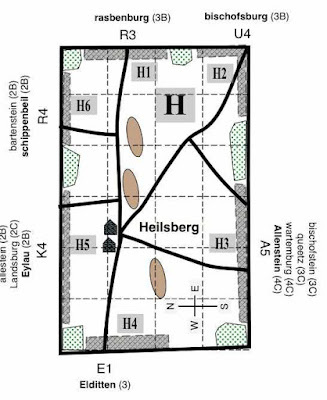 At 15:30, I again surveyed the tables to lay out a map illustrating the overall situation (see the other photo). 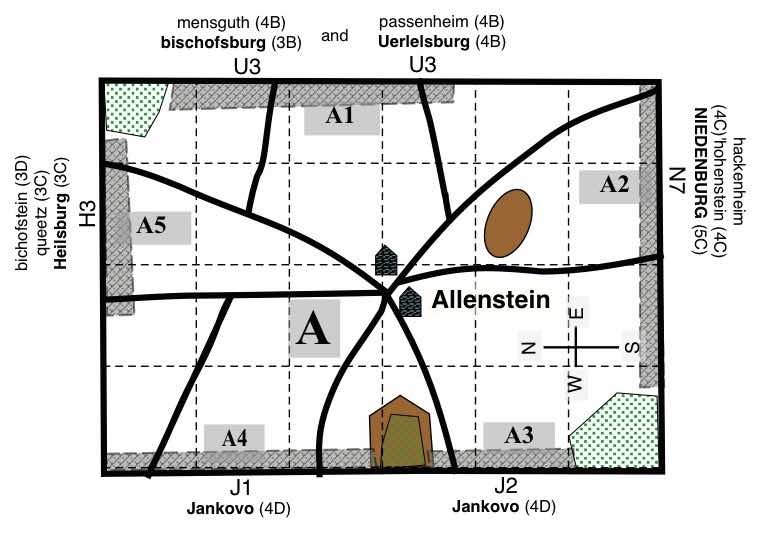 The situation is much the same as at 14:20, but the Heilsburg battle had ended and Allied forces had moved into Allenstein (Table A), with Ney's force doing it's blocking effort down at Jankovo against the Prussians. The Allied force at Allenstein (Brian - Tuchkov's 5th Div?) 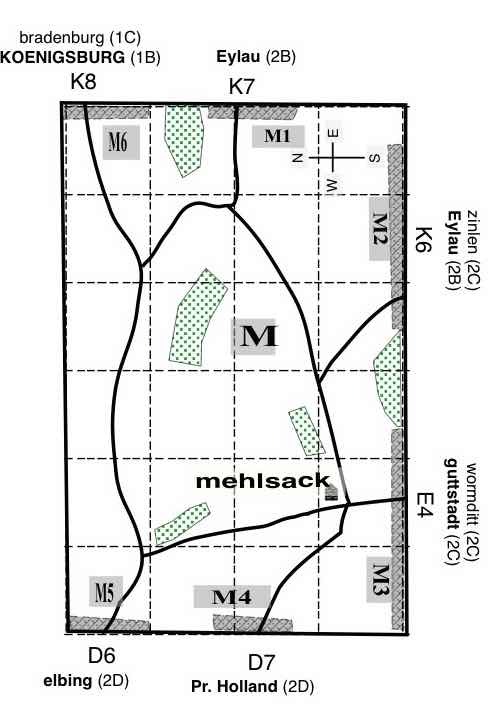 could have pushed on into Neidenburg (Table N) against the light French screen there (say, leaving a covering force at Allenstein to protect the Russian LOC back through Elditten and Mehlasck). Instead, this force turned west (downwards on the map) to chase Ney. Not an unreasonable decision as the Prussians (to me) looked like they were getting beat up by Ney's remnants until Brian arrived. Even then, Ney looked like he was full of fight, again out numbered some three-to-one. Ah, you got to love the crazy fool. (Peter: actually, Brian had specific orders to pursue Ney, and if possible, come upon the Danzig table from behind via table J, i.e. via the J7/D3 Deployment zones. The appearance of the new "reserve" French Corps from Warsaw under Rapp (Mike), and Ney's aggressive actions prevented that from happening. However, Lestocq did manage to sneak into Jankovo, relieving Graudenz and scoring another VP - good opportunism on his part! As for Ney, he truly deserved the "Bravest of the Brave" sobriquet that day!). Anyway, I am heading off to the Huzzah convention tomorrow in Portand, ME for the weekend. Hopefully, I will see (have seen?) some of you there and we can continue hashing the glories. Thanks all for what I truly found has been a very enjoyable time and project. And again, particular thanks to Peter for his efforts and support. (Peter: Thank YOU, James! You did a super job, and put in a heck of a lot of hard work. It very much showed in the final product! Best of all, I didn't have to do it this year, and maybe Dan will do it next year! Hope you have a great time at Huzzah! Perhaps I'll make it there some year if I don't go to Historicon. I am increasingly thinking of doing a Snappy Nappy Campaign in a Day there at some point - maybe 2018?